In a new study based on EU adverse drug reaction reports, researchers at the University of Copenhagen and the University of Southern Denmark now document that children’s use of asthma medications may result in serious adverse drug reactions. The risk of adverse drug reactions is not fully documented in the pre-marketing clinical trials. The new study has been published in the International Journal of Clinical Pharmacy. 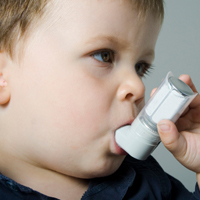 Asthma is one of the most common chronic diseases in children. “We have studied all EU adverse drug reaction reports on asthma medications approved for – and used by – children over a five-year period (2007 to 2011). In the light of the total use of asthma medications, the number of reported ADRs were not overwhelming – a total of 774 ADR reports – however, 85% of these ADRs, almost all reported by physicians, are classified as serious,” says Professor Ebba Holme Hansen from the Department of Pharmacy, University of Copenhagen. Together with Professor Lise Aagaard from the University of Southern Denmark, she carried out the new scientific study published in the International Journal of Clinical Pharmacy. “It is an interesting observation and one which health professionals should take into account when prescribing medicine to children,” says Ebba Holme Hansen. “No one knows the consequences of prescribing drugs to children, who constitute a vulnerable patient group, as knowledge of ADRs in this population is very scarce. Infants under one year of age are prescribed asthma medications as cough medicine, as no alternative treatments are available for very young children. However, our study suggests that asthma medications are associated with more – and more serious – ADRs than documented by the clinical trials. Especially in the case of children,” says Lise Aagaard. “In a clinical trial, patients are provided with the assistance and guidance needed to take their medication correctly and at the right time. It is, of course, a totally different situation for sufferers who do not have immediate access to a health professional in their everyday lives. In Denmark, asthma patients can have their inhalation technique checked at pharmacies via a ‘Check your inhalation’ service provided free of charge by the Danish state,” says Lise Aagaard.